If you are exploring CRM solutions, no doubt you have a lot of questions. Many of them can be answered by reading posts by the experts on our CRM Software Blog. You can gain a wealth of information, but one question you will rarely see answered until you sit down with a partner is: How much will it cost? The reason it’s not easy to pin down an estimate for some CRM solutions (plus ongoing license and user fees) is that there are so many variables. The CRM Software Blog has a solution for that. We have developed a Quick Quote Wizard designed to give you a working estimate of the total cost of CRM implementation. It’s a hassle-free way to find out if Microsoft Dynamics 365 (formerly Microsoft Dynamics CRM) is a fit for your business and your budget. The Quick Quote Wizard takes only takes a few minutes and it’s completely free. Just fill out the Microsoft Dynamics 365 Quick Quote Request form to let us know whether you’re interested in the Business Edition or Enterprise Edition, what level you want (Basic, Basic Plus or Advanced), how many users you anticipate, and your contact information. It’s as easy as that. Click submit and within a couple of minutes a personalized proposal will appear in your inbox. 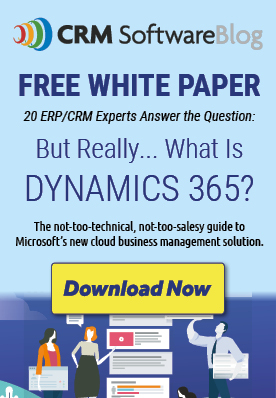 The proposal will contain not only a detailed budgetary estimate, but also information about setup and training, client testimonial videos, and a dozen or so links to helpful information so you can learn all about how Microsoft Dynamics 365 can be used to the greatest advantage at your company. Your contact information will be forwarded to just one of our CRM Software Blog members who will be glad to answer any questions you have and work with you on the installation if you choose. Of course, both the estimate and the partner referral are non-binding. They are provided for your convenience. So, why not try the Quick Quote tool? It’s fast, it’s free. Get your Quick Quote proposal now!